My hair color has always been a prominent shade of dark brown naturally. People used to say that I would never need to color my hair because of the natural color I have. I never had the urge of getting my colored, but when a salon like JCB asked me if I would like to get my hair colored or not, I couldn't say no! Because, well, I wanted to experiment! So, I am writing down my experience with Jean-Claude Biguine and a little about getting your hair colored for the first time. And since I had heard a lot of great things about them, I was, naturally, very excited about this. And I was already excited about getting my hair colored. A piece of advice - Do not color your hair just because it is trending or your friends are getting their hair colored or some influential person got her hair colored. Get your hair colored only when YOU want to, because YOU solely want to get it done. It's not something you can wash off after a week! And if you want a temporary color, like for a day, try hair chalking or temporary hair color sprays.JCB can help you out with the same! The staff at JCB is lovely, first of all! So, you will enjoy any service that you get done there. I went in to get my hair colored and enjoyed that thoroughly. 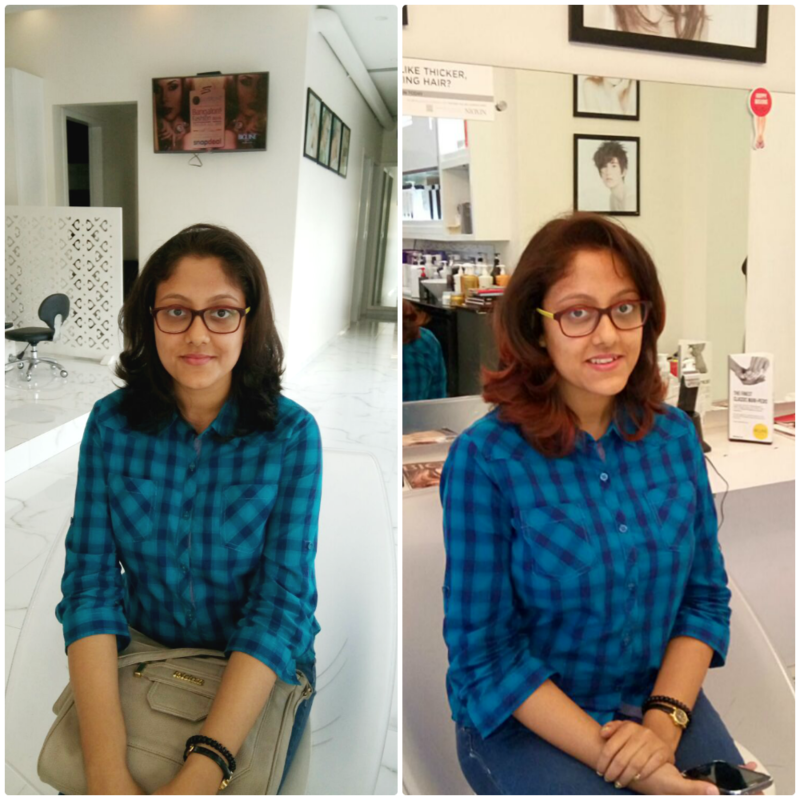 First, I was asked what type of style I would like, my preference, if I would like a complete makeover and my hairdresser, Rinku, he suggested a few things that would suit me according to the things I had asked for. A lot of color options were given to me, again according to what I had asked for and also keeping in mind the colors that would suit my skin tone etc. 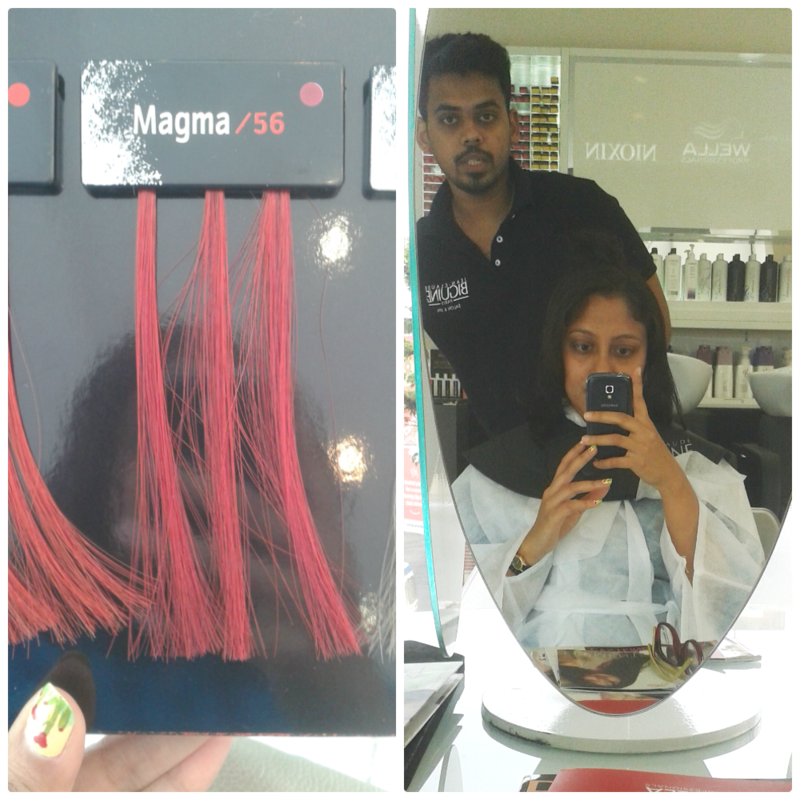 I wanted to go for a red color and finally decided on a copper- red from the magma range. All colors were from wella's professional hair color range. There are different sort of color ranges which provide different results. I went in for the one which would change colors after somedays. 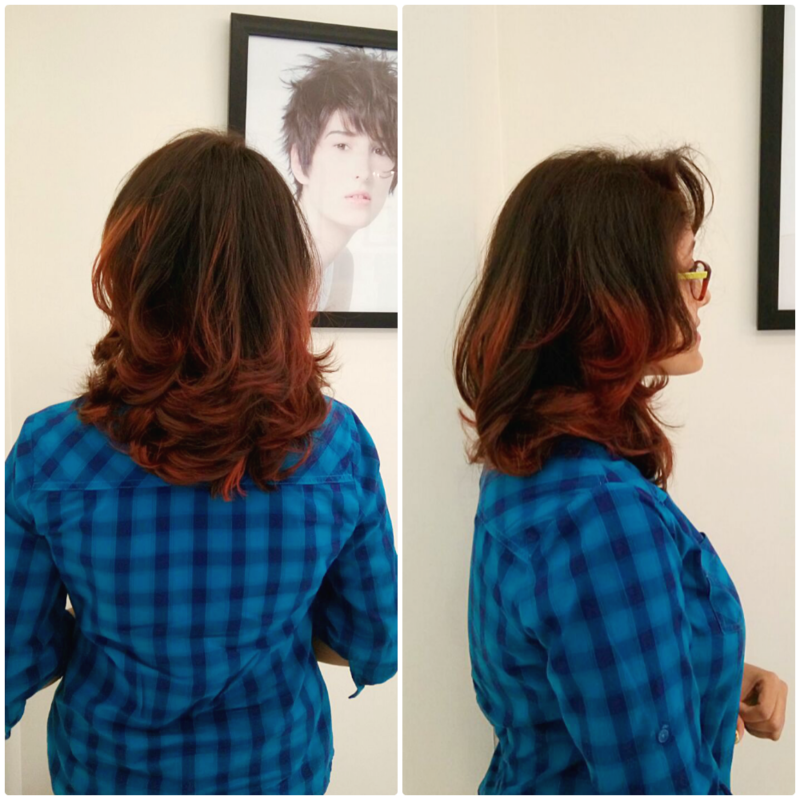 So the color I chose, as Rinku explained, would stay coppery red for a month or so and then wash out to a copper brown shade. This way I would get two colors and I went in with that happily! I stressed on the point that I want something subtle but not too subtle. And I received exactly that. My hair ends were done using the dip dye technique.I confused it with Balayage, but both the techniques are different! I had asked for something done to the ends of my hair, so just in case I got bored, I could cut it off. Rinku helped me to set a hair care routine for the next one month. Keeping in mind that I colored my hair red, I had to take extra care of it. He suggested that I use a color protectant shampoo and conditioner. I got the conditioner, because I don't like the shampoos from the salon ranges. After a month and a half the red color completely faded away and I was more than happy because of the coppery brown color that my was at that moment. Now, I talked with Rinku about the damage etc that the hair would go through before coloring my hair, and he had explained everything in detail. Also, which range would be the best to use to avoid any sort of damage. As expected after almost 6 months my hair still has the brown color and still didn't cause any damage. Like any normal person , even without colored hair , I got a few split ends after 6 months of not cutting my hair. So I can safely say that getting your hair colored isn't damaging your hair, when you are getting your hair done from the experts! And the people at JCB are clearly good at what they do! I had made a point to write the post just before getting a haircut and I will get a haircut in a few days. I am very happy with my hair makeover at The Jean-Claude Biguine salon! and I would definitely go to them when I want to color my hair again! If you have any other question regarding the this, please send me a mail at priyanjanamns@gmail.com. I would be happy to help you. *I was invited by JCB to experience their hair makeover service. Honest opinions as always. The colour seems to brighten your complexion itself!! Hahaha, yeah! Hair color has so much of an impact!